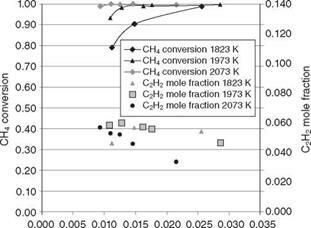 20.9 (a) Temperature dependence of CH4 conversion and C2H2 off-gas mole fraction vs residence time (CH4 mole fraction in the feed: 20%) in the 20 kW solar reactor (Rodat et al., 2010a). 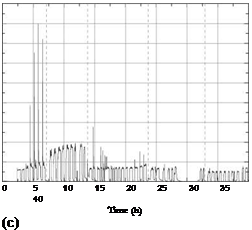 (b) CH4 conversion, H2 yield, and C yield vs temperature for the 50 kW pilot solar reactor (Ar: 31.5 NL/min, CH4: 10.5 NL/min), (Rodat et al., 2010b). 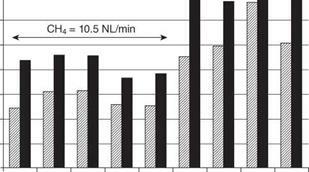 20.10 Thermochemical and thermal efficiencies of the pilot solar reactor (Rodat et al., 2010b). required high temperatures. The monolith channels are coated with an active water-splitting material and the overall reactor looks very similar to the familiar catalytic converter of modern automobiles. 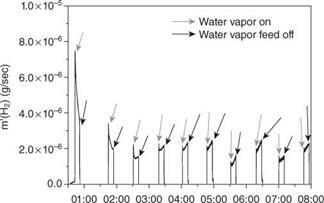 When steam passes through the solar reactor, the coating material splits water vapor by ‘trapping’ its oxygen and leaving in the effluent gas stream pure hydrogen. 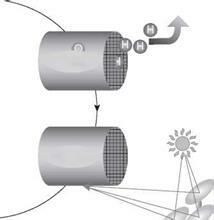 In a subsequent step the oxygen ‘trapping’ coating is regen­erated by increasing the amount of solar heat absorbed by the reactor and hence a cyclic operation is established in a single solar receiver-reactor (Fig. 20.11). 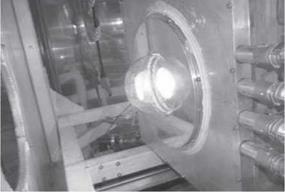 The proof of concept was demonstrated on the solar receiver – reactor, HYDROSOL-I, at the solar facilities at the German Aerospace Center (DLR), where quasi-continuous solar-operated water-splitting regeneration cycles were achieved, producing the first ever solar hydrogen with monolithic honeycomb reactors (Konstandopoulos and Lorentzou, 2010; Roeb et al., 2006a; Agrafiotis et al., 2006a, 2006b, 2007b). 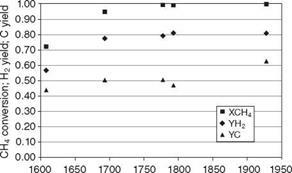 The next generations of HYDROSOL reactors were the HYDROSOL-I dual-chamber reactor (Roeb et al., 2006a, 2009) and the 100 kW pilot-scale HYDROSOL-II reactor (Roeb et al., 2011). All the reactors constructed within the two HYDROSOL projects can be seen in non-operational mode in Figs 20.12 and 20.13. HYDROSOL-I (Fig. 20.12) and the dual-chamber reactor (Fig. 20.13) were operated at the solar facilities in DLR, while HYDROSOL-II (Fig. 20.14) operates at the Plataforma Solar de Almeria in Spain (PSA). Four major experimental campaigns have been carried out in the HYDROSOL-I and the dual-chamber reactors, to investigate, evalu­ate and iteratively optimize the water-splitting efficiency and regeneration capability of the nanostructured materials. 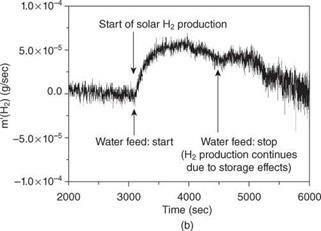 20.11 The HYDROSOL metal oxide thermochemical cycle for solar – water-splitting (Konstandopoulos and Lorentzou, 2010). 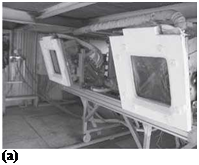 The first two campaigns were carried out in the 3 kW solar HYDRO – SOL-I reactor (Fig. 20.12). 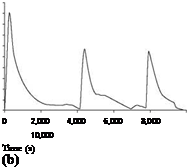 In the first campaign, the coated monoliths were able to react with water and produce solar hydrogen at 800°C and regener­ate at 1200°C, for the first time (Fig. 20.12(b)). In the second campaign, multiple sequential water-splitting and regeneration steps were achieved (Fig. 20.12(c)). 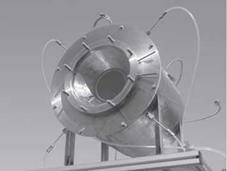 The HYDROSOL-I dual-chamber reactor (Fig. 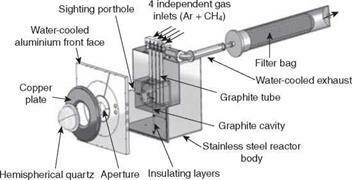 20.13), with its modular design, allowed continuous solar hydrogen production. 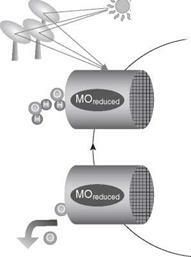 While in one of the modules water-splitting took place, the other was regenerated. By switching the feed gas and controlling the amount of solar radiation that strikes each module, the regenerated part can be switched to the splitting mode and vice versa. 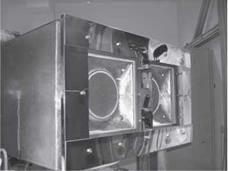 Meeting the different heat demands for the two reactions (water­splitting and regeneration) that take place alternately in the two modules was achieved by providing two focal points (one on each module) with dif­ferent flux density via re-alignment of the facets of a faceted solar concentra­tor at the solar furnace facility of DLR. In the third solar campaign, hydrogen was produced continuously for five days, which was the period that was available to the consortium for the use of the solar furnace (Fig. 20.13(c)). 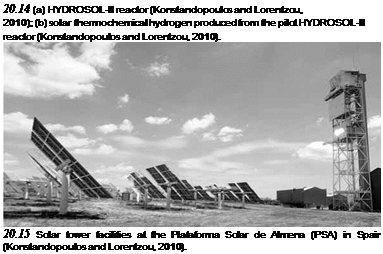 20.12 (a) HYDROSOL-I reactor (Agrafiotis et al, 2005); (b) proof of concept – first solar hydrogen production (Konstandopoulos and Lorentzou, 2010); (c) multiple sequential hydrogen production cycles in the HYDROSOL-I reactor. 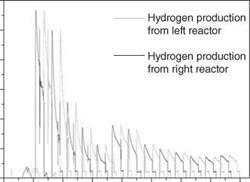 20.13 (a) HYDROSOL-I reactor dual chamber (Konstandopoulos and Lorentzou, 2010); (b) continuous hydrogen production from the two modules (Konstandopoulos and Lorentzou, 2010); (c) continuous hydrogen production for five sequential days performed with one sample. alternately shift from the water-splitting to the regeneration mode. 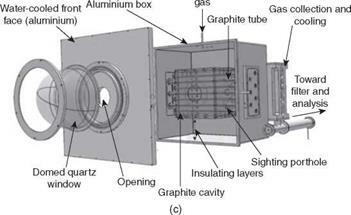 The control of the temperature of each module is achieved with strategic adjust­ment of the heliostat field (Fig. 20.16). The development towards commercialization continues with the Hydro­sol-3D project which focuses on the pre-design and design of a 1 MW solar demonstration plant. The options that will be investigated are the adapta­tion of the hydrogen production plant to an already available solar facility or the development of a new, completely optimized hydrogen production/ solar plant.